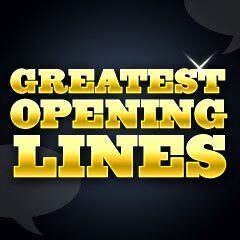 Greatest Opening Film Lines and Quotes: These are many of the best-known opening lines, fade-ins, and first words of dialogue heard throughout cinematic history - the initial opening words of films are sometimes heard even before the title credits. In quite a few cases, the memorable opening lines are also some of the greatest lines in film history. They often reveal a vital truth about the film, introduce the film, or help to define what the film was all about. The words, often spoken by an off-screen narrator or character, often help to set a mood or tone before the film begins, and they are often great one-liners. See also Greatest Last Words and Closing Film Lines. (title card) "Revolution is the only lawful, equal, effectual war. It was in Russia that this war was declared and begun." "Hello, hello, hello. Is that the clinic? This is Senf, the Head Porter, Grand Hotel. How's my wife? Is she in pain? Isn't the child coming soon? Patience? Would you have patience?" - "OK. Say, Jones and Barry are doin' a show!" - "That's great. Jones and Barry are doin' a show." (sung) "Gone are my blues and gone are my tears. I've got good news to shout in your ears. The long-lost dollar has come back to the fold. With silver you can turn your dreams to gold. So, We're in The Money, We're in the Money. We've got a lot of what it takes to get along. We're in the Money, the sky is sunny, Old Man Depression you are through, You done us wrong!..." - "Say, is this the moving-picture ship?" - "The Venture? Yeah. Are you goin' on this crazy voyage?" - "What's crazy about it?" - "I don't know. But everybody around here is talkin' about that crazy fella that's a-running it." - "Guess that's the name. They say he ain't scared of nothin'. If he wants a picture of a lion, he just goes up to him and tells him to look pleasant." - "He's a tough egg all right, but why all this talk about this voyage being crazy?" - "Well, everybody around the docks is talkin' about the cargo, for one thing. And I never did see a ship this size with such a crew." - "Not enough men to handle her?" - "Not enough! Three times more than the ship needs. I don't see where they're gonna have room enough to sleep." - "Hey, down there. What do you want?" - "My name is Weston, the theatrical agent." - "Oh, why didn't you say so? Come on aboard. Denham's gettin' wild. I hope you've got some good news for him." "Hunger strike, eh? How long has this been going on?" - "Slave in the Magic Mirror, come from the farthest space. Through wind and darkness, I summon thee. (Wind howling) Speak! Let me see thy face." - "What wouldst thou know, my Queen?" - "Magic Mirror on the wall, who is the fairest one of all?" - "Famed is thy beauty, Majesty. But hold, a lovely maid I see. Rags cannot hide her gentle grace. Alas, she is more fair than thee." - "Alas for her! Reveal her name." - "Lips red as the rose. Hair black as ebony. Skin white as snow." - "What do we care if we were expelled from college, Scarlett. The war is gonna start any day now, so we would've left college anyhow." - "War! Isn't it exciting, Scarlett? Do you know those poor Yankees actually want a war?" "Senator Samuel Foley - dead. Yeah, yeah. Died a minute ago here at St. Vincent's. At the bedside was state political sidekick Senator Joseph Payne. Yeah!" (title card) "This picture takes place in Paris in those wonderful days when a siren was a brunette and not an alarm --- and if a Frenchman turned out the light, it was not on account of an air raid!" - "Is there anything I can do for you, Monsieur?" (sounds of bugles) - "These hills here are full of Apaches. They burnt every ranch building in sight. He had a brush with 'em last night. Says they're bein' stirred up by Geronimo." - "Geronimo? How do we know he isn't lyin'?" - "Naw, he's a Cheyenne. They hate Apaches worse than we do." (title card) "For nearly forty years this story has given faithful service to the Young in Heart; and Time has been powerless to put its kindly philosophy out of fashion. To those of you who have been faithful to it in return...and to the Young in Heart...we dedicate this picture." "She isn't coming yet, Toto. Did she hurt you? She tried to, didn't she? Come on. We'll go tell Uncle Henry and Auntie Em. Come on, Toto." (title card) "On the barren Yorkshire moors in England, a hundred years ago, stood a house as bleak and desolate as the wastes around it. Only a stranger lost in a storm would have dared to knock at the door of Wuthering Heights." - (barking dogs) "Call off your ungodly dogs!" - "Down! Down! Down! Quiet! Down!" - "Are you Mr. Heathcliff?" - "Well, I'm Mr. Lockwood, your new tenant at the Grange. I'm lost. I - can I get a guide from amongst your lads?" - "No, you can not. I've only got one and he's needed here." - "Oh, well, then, I'll have to stay til morning." - "Do as you please. Quiet! Down!" - "Thank you for your hospitality. Could you extend it to a cup of tea?" (voice-over) "Last night, I dreamt I went to Manderley again. It seemed to me I stood by the iron gate leading to the drive, and for a while I could not enter for the way was barred to me. Then, like all dreamers, I was possessed of a sudden with supernatural powers and passed like a spirit through the barrier before me. The drive wound away in front of me, twisting and turning as it has always done. But as I advanced, I was aware that a change had come upon it. Nature had come into her own again, and little by little had encroached upon the drive with long tenacious fingers, on and on while the poor thread that had once been our drive. And finally, there was Manderley - Manderley - secretive and silent. Time could not mar the perfect symmetry of those walls. Moonlight can play odd tricks upon the fancy, and suddenly it seemed to me that light came from the windows. And then a cloud came upon the moon and hovered an instant like a dark hand before a face. The illusion went with it. I looked upon a desolate shell, with no whisper of the past about its staring walls. We can never go back to Manderley again. That much is certain. But sometimes, in my dreams, I do go back to the strange days of my life which began for me in the south of France..."
(title cards) "It's a story they tell in the border country where Massachusetts joins Vermont and New Hampshire. It happened, so they say, a long time ago. But it could happen anytime - anywhere - to anybody..."
"Yes - it could happen even to you." - "Ma! Mary! All ready? First bell's a-ringing." - "Yes, we're all ready. Mary's comin' through the back door. Now, son. Cheer up. We're all healthy, and we've still got meal in the barrel. Look at that sky, big cracks in it like it was ice on the mill pond crackin' up to show it's spring a-comin'. If that ain't enough for a God-fearin' New Hampshire family, I want to know." (voice-over) "I am packing my belongings in the shawl my mother used to wear when she went to the market. And I'm going from my valley. And this time, I shall never return. I am leaving behind me my fifty years of memory. Memory. Strange that the mind will forget so much of what only this moment has passed, and yet hold clear and bright the memory of what happened years ago - of men and women long since dead. Yet who shall say what is real and what is not? Can I believe my friends all gone when their voices are still a glory in my ears? No. And I will stand to say no and no again, for they remain a living truth within my mind. There is no fence nor hedge round Time that is gone. You can go back and have what you like of it, if you can remember. So I can close my eyes on my Valley as it is today - and it is gone - and I see it as it was when I was a boy. Green it was, and possessed of the plenty of the earth. In all Wales, there was none so beautiful." - "There's a girl wants to see you. Her name's Wonderly." - "I guess so. You'll want to see her anyway. She's a knockout." - "Shoo her in, Effie darling. Shoo her in." - "You can come in, Miss Wonderly." (voice-over) "With the coming of the Second World War, many eyes in imprisoned Europe turned hopefully or desperately toward the freedom of the Americas. Lisbon became the great embarkation point. But not everybody could get to Lisbon directly. And so a torturous, round-about refugee trail sprang up. Paris to Marseilles, across the Mediterranean to Oran [in Algeria], then by train or auto or foot across the rim of Africa to Casablanca in French Morocco. Here the fortunate ones through money or influence or luck might obtain exit visas and scurry to Lisbon, and from Lisbon to the New World. But the others wait in Casablanca, and wait and wait and wait." - "You won't believe this. You've probably heard it a dozen times before, but I've never known any artists." - "I am not an artist." - "Well, what's all this?" - "I do sketches for fashion drawings." - "Oh. May I see it?" - "Oh, no, it's not good. If I let you see it, you might not want to know any artists, ever." - "I'm afraid it would have to be pretty bad to do that. Besides, look: 'Let No One Say, And Say It To Your Shame...'"
(voice-over) "The magnificence of the Ambersons began in 1873. Their splendor lasted throughout all the years that saw their Midland town spread and darken into a city. In that town in those days, all the women who wore silk or velvet knew all the other women who wore silk or velvet and everybody knew everybody else's family horse and carriage. The only public conveyance was the streetcar. (Yoohoo) A lady could whistle to it from an upstairs window, and the car would halt at once, and wait for her, while she shut the window, put on her hat and coat, went downstairs, found an umbrella, told the 'girl' what to have for dinner, and came forth from the house. Too slow for us nowadays, because the faster we're carried, the less time we have to spare." (voice-over) "Our story takes you down this shadowed path to a remote and guarded building in the English Midlands, Melbridge County Asylum. Grimly proud of its new military wing, which barely suffices in this autumn of 1918 to house the shattered minds of the war that was to end war." (voice-over) "Lubinski, Kubinski, Lominski, Rozanski and Poznanski. We're in Warsaw, the capital of Poland. It's August, 1939. Europe is still at peace. At the moment, life in Warsaw is going on as normally as ever. But suddenly, something seems to have happened. Are those Poles seeing a ghost? Why does this car suddenly stop? Everybody seems to be staring in one direction. People seem to be frightened, even terrified. Some flabbergasted. Can it be true? It must be true. No doubt. The man with the little mustache, Adolf Hitler. Adolf Hitler in Warsaw when the two countries are still at peace - and all by himself? He seems strangely unconcerned by all the excitement he's causing. Is he by any chance interested in Mr. Maslowski's delicatessen? That's impossible! He's a vegetarian. And yet, he doesn't always stick to his diet. Sometimes he swallows whole countries. Does he want to eat up Poland, too? Anyhow, how did he get here? What happened? Well..."
(voice-over) "I am Matthew Macauley. I have been dead for two years, but so much of me is still living that I know now the end is only the beginning. As I look down on my homeland of Ithaca, California, with its patches of vineyards and orchards, I feel so much of me is still living there in the places I've been, in the fields, the streets, the church, and, most of all, my home where my hopes, my dreams, my ambitions, my beliefs still live in the daily lives of my loved ones. Yes, they're even reflected in the shining face of my youngest son Ulysses Macauley, who is so intently watching the gopher as it pushes up the dirt in my backyard. " (voice-over narration, reading) "My name is Jane Eyre. I was born in 1820, a harsh time of change in England. Money and position seemed all that mattered. Charity was a cold and disagreeable word. Religion too often wore a mask of bigotry and crueIty. There was no proper place for the poor or the unfortunate. I had no father or mother, brother or sister. As a child, I lived with my aunt, Mrs. Reed of Gateshead Hall. I do not remember that she ever spoke one kind word to me." (title screen) "This is a Hallowe'en tale of Brooklyn, where anything can happen - - and it usually does. At 3 P.M. on this particular day, this was happening -"
- "I'll knock your block off, you big stiff! You're a bum!" (title screen) "While at the same time across the river in the UNITED STATES PROPER there was a romance in the air." - (knocking) "Why, hello there, Mr. Neff. Working pretty late, aren't you, Mr. Neff?" - "Late enough. Let's ride." - "You look kind of all in, at that." - "How is the insurance business, Mr. Neff?" - "They wouldn't ever sell me any. They said I had something loose in my heart. Ha, ha. I say it's rheumatism." - "Office memorandum. Walter Neff to Barton Keyes, Claims Manager, Los Angeles, July 16, 1938. Dear Keyes: I suppose you'll call this a confession when you hear it. Well, I don't like the word 'confession.' I just want to set you right about something you couldn't see because it was smack up against your nose. You think you're such a hot potato as a Claims Manager, such a wolf on a phony claim. Maybe you are. But let's take a look at that Dietrichson claim: Accident and Double Indemnity. You were pretty good in there for a while, Keyes. You said it wasn't an accident. Check. You said it wasn't suicide. Check. You said it was murder. Check. You thought you had it cold, didn't ya? All wrapped up in tissue paper with pink ribbons around it. It was perfect - except it wasn't because you made one mistake. Just one little mistake. When it came to picking the killer, you picked the wrong guy. You want to know who killed Dietrichson? Hold tight to that cheap cigar of yours, Keyes. I killed Dietrichson. Me, Walter Neff, insurance salesman, 35 years old, unmarried, no visible scars... until a while ago, that is. Yes, I killed him. I killed him for money and for a woman. I didn't get the money and I didn't get the woman. Pretty, isn't it?" (voice-over) "I shall never forget the weekend Laura died. A silver sun burned through the sky like a huge magnifying glass. It was the hottest Sunday in my recollection. I felt as if I were the only human being left in New York. For with Laura's horrible death, I was alone. I, Waldo Lydecker, was the only one who really knew her, and I had just begun to write Laura's story when another of those detectives came to see me. I had him wait. I could watch him through the half-open door. (clock chimes) I noted that his attention was fixed upon my clock. There was only one other in existence, and that was in Laura's apartment, in the very room where she was murdered." (title screen) "This is a story of the Unconquerable Fortress - the American Home...1943." (voice-over) "This is the moment I've dreaded, coming back to our home - alone. Oh, Tim. Tim. You've been gone only an hour, and already the house is empty without you. Darling, forgive me. I held myself together through all our goodbyes and I've tried to understand, but I still don't know why you should risk your life. You, the best-natured and dearest person in the world. I'll try to remember what you said last night, that years from now, this will seem the greatest adventure we ever had, even though we had it separately. But I have no courage, Tim. You know I have no courage, and I have no vision. And already I'm, I'm so very Ionely. We've had at least today. I'll try to keep all the good things as they were. I'll keep the past alive, like a warm room for you to come back to. I promise. I promise." - (door buzzer) "Well, my name's Marlowe. General Sternwood wanted to see me." - "Yes, Mr. Marlowe. Do come in, please, sir? I'll tell the General that you're here." - "Well, thank you. Good morning." - "You're not very tall, are you?" - "Well, I, uh, I try to be." - "Not bad-looking, though you probably know it." - "Ha, that's a funny kind of name." - "Uh-huh. What are you, a prize fighter?" - "No, I'm a shamus." - "You're making fun of me." - "The general will see you now, sir." - "Miss Carmen Sternwood, sir." - "You ought to wean her. She's old enough." (voice-over) "Deep among the lonely sun-baked hills of Texas, the great and weatherbeaten stone still stands. The Comanches called it Squaw's Head Rock. Time cannot change its impassive face, nor dim the legend of the wild young lovers who found Heaven and Hell in the shadows of the rock. For when the sun is low and the cold wind blows across the desert, there are those of Indian blood who still speak of Pearl Chavez, the half-breed girl from down along the border and of the laughing outlaw with whom she here kept a final rendezvous, never to be seen again. And this is what the legend says - a flower, known nowhere else, grows from out of the desperate crags where Pearl vanished. Pearl - who was herself a wild flower sprung from the hard clay, quick to blossom and early to die." (voice-over) "To me a dollar was a dollar in any language. It was my first night in the Argentine and I didn't know much about the local citizens. But I knew about American sailors, and I knew I'd better get out of there." (voice-over) "My father's family name being Pirrip, and my Christian name, Phillip, my infant tongue could make of both names nothing longer or more explicit than 'Pip'. So I called myself Pip and came to be called Pip." (voice-overs) - "I owe everything to George Bailey. Help him, Dear Father. " - "Joseph, Jesus and Mary. Help my friend, Mr. Bailey." - "Help my son, George, tonight." - "He never thinks about himself, God, that's why he's in trouble." - "George is a good guy. Give him a break, God." - "I love him, dear Lord. Watch over him tonight." - "Please, God, something's the matter with Daddy. Please bring Daddy back." - "What'll it be, gentlemen?" - "I don't know. What do you want to eat, Al?" - "I don't know what I want to eat." - "I'll have the roast pork tenderloin with the applesauce and mashed potatoes." - "That's not ready yet." - "Then what's it on the card for?" - "Well, that's on the dinner. You can have that at 6:00 o'clock. That clock is ten minutes fast. The dinner isn't ready yet." - "Never mind the clock. What have you got to eat?" - "Well, I can give you any kind of sandwiches, bacon and eggs, liver and bacon, ham and eggs, steaks..."
- "I'll take the, uh, chicken croquettes with the cream sauce, the green peas and the mashed potatoes." - "That's on the dinner, too." - "Everything we want's on the dinner. That's the way you work it, huh?" - "I can give you ham and eggs, bacon and eggs..."
- "I'll take the ham and eggs." - "Give me bacon and eggs." - "One ham and, bacon and." - "You got anything to drink?" - "I can give you soda, beer, ginger ale..."
- "I said, have you got anything to drink?" - "This is a hot town. What do ya call it?" - "Did you ever hear of Brentwood? What do you do here nights?" - "They eat the dinner. They all come here and eat the big dinner." - "You're a pretty bright boy, aren't ya?" - "Well, you're not. Is he, Al?" (scrolling title card) "This is a story of two Worlds - the one we know and another which exists only in the mind of a young airman whose life & imagination have been violently shaped by war. Any resemblance to any other world known or unknown is purely coincidental." (voice-over) "This is the universe. Big, isn't it? Thousands of suns, millions of stars, separated by immense distances and by thin floating clouds of gas. The starlight makes the gas transparent. Where there are no stars, it appears as dark, obscuring clouds like that great black cone over there. Hello, there's a nova. A whole solar system exploded. Someone must've been messing about with the uranium atom. No, it's not our solar system, I'm glad to say. Ah, those are called a globular cluster of stars. Rather fine. Down here in the right-hand corner, see that little chap rather like a boy scout's badge? It's a mass of gas expanding at thousands of cubic miles a minute. Ah, here we are, we're getting nearer home. The moon, our moon, in the first quarter, and here's the Earth, our Earth, moving around in its place, part of the pattern, part of the universe. Reassuring, isn't it?" (voice-over) - "It was on a side road outside of Los Angeles. I was hitchhiking from San Francisco down to San Diego, I guess. A half-hour earlier, I'd thumbed a ride." - "Well, so long, mister. Thanks for the ride, the three cigarettes and for not laughin' at my theories on life." - "But you broke off right in the middle of a sentence. Why do you keep looking for new places, new people, new ideas?" - "Well, l never liked any job l've had. Maybe the next one is the one I've always been lookin' for." - "Not worried about your future?" - "Well, l got plenty of time for that. Besides, maybe my future starts right now." - "Well, good luck. Maybe l'll be seeing you again." - "Thanks for the ride, mister." "You've got them mixed up! You're making a mistake. You're making a mistake with the reindeer. Tsk tsk tsk." (voice-over) "Manhattan, New York, USA. In any discussion of contemporary America and how its people live, we must inevitably start with Manhattan, New York City, USA. Manhattan, glistening modern giant of concrete and steel reaching to the heavens and cradling in its arms seven millions. Seven millions, appy beneficiaries of the advantages and comforts this great metropolis has to offer. Its fine, wide boulevards facilitate the New Yorkers' carefree, orderly existence." (title cards before credits) "This boy and this girl were never properly introduced to the world we live in. To tell their story..."
- "I knew that tire had to go." - "You talk too much." - "Now to get to that brother of yours and get that dough you got stashed away." - "Let's go, let's go. Come on." - "Let's go, let's go, let's go." - "How far we gotta go?" - "You two go on." - "You hole up in here, back of the sign. One of us will come back for ya tonight, we'll blink the headlights on the car." - "At least you got company." - "Take it easy, son." - "I'll take it easy. I've got a lawyer in Tulsa to see." (voice-over) "Well, this is how New York looks when you see it in the movies and on picture postcards. And this is how it looked to me, Jane Stacey, when I first came here from Connecticut. But New York's a great town. It's got Park Avenue. Lovely, isn't it? I wish I lived there, but I don't. I live in Mrs. O'Reilly's Boarding House at 185 West 73rd Street, Apartment 3-B, next to a charming delicatessen. But I still love New York, because it's full of unusual sights, and the most unusual sight in town is my friend Irma. See if you can pick her out. Having a little trouble? Then let me help you spot her. You see that street over there, that's being torn up? And that sign that says, 'Men at work, beware'? You notice how all the normal people are walking around that hole? Well, in a few minutes, you will be able to pick out my roommate, Irma Peterson. Watch." (voice-over) "I never knew the old Vienna before the war, with its Strauss music, its glamour and easy charm - Constantinople suited me better. I really got to know it in the classic period of the Black Market. We'd run anything, if people wanted it enough and had the money to pay. Of course, a situation like that does tempt amateurs, but, but you know they can't stay the course like a professional. Now the city - it's divided into four zones, you know, each occupied by a power - the American, the British, the Russian, and the French. But the center of the city - that's international, policed by an International Patrol, one member of each of the four powers. Wonderful. What a hope they had, all strangers to the place and none of them could speak the same language, except a sort of smattering of German. Good fellows on the whole, did their best, you know. Vienna doesn't really look any worse than a lot of other European cities, bombed about a bit. Oh, I was gonna tell you, wait, I was gonna tell you about Holly Martins, an American. Came all the way here to visit a friend of his. The name is Lime, Harry Lime. Now Martins was broke and Lime had offered him some sort - I don't know - some sort of a job. Anyway, there he was, poor chap, happy as a lark and without a cent."